Updated: 13th Dec 2014; This restaurant is closed and the owner has reopened as John 3:16 Malaysian Delights. 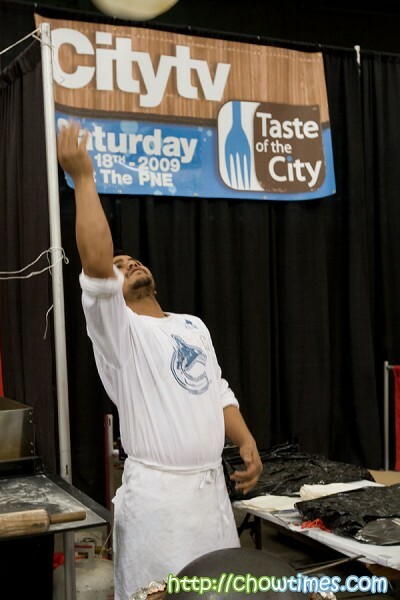 Note: The latest post about the Richmond Public Market is of February 2011 and is found on this link. It had been ages since we stepped into the Richmond Public Market. We were shopping for groceries around that area and decided to go to the Richmond Public Market to get some desserts — ice plate specifically. Something tells me that we could get it there. The Richmond Public Market was a great idea which I felt went wrong. Unlike the many public markets around Metro Vancouver, the Richmond Public Market seems to be suffering from some bad choices of tenants. About the only thing that will draw us here is the food court. The design of the Richmond Public Market is good. It is brightly lit with a sky roof and the layout is practical. However, they seems to allow all kinds of businesses here without much regard on how they fit in to the overall image. For instance, I felt it strange to see a lot which sells mattresses and beds next to the butcher stall. I am just not proud of my city’s public market really. 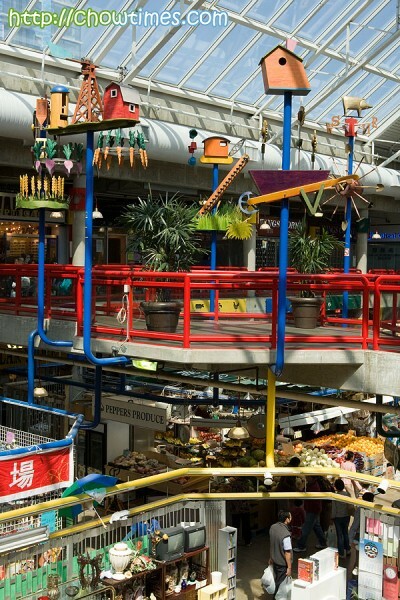 What is interesting at the Richmond Public Market is the food court. It is like a collection of Asian hole-in-the-walls. Obviously this is MSG-city but the food here is cheap and in many instances really authentic. 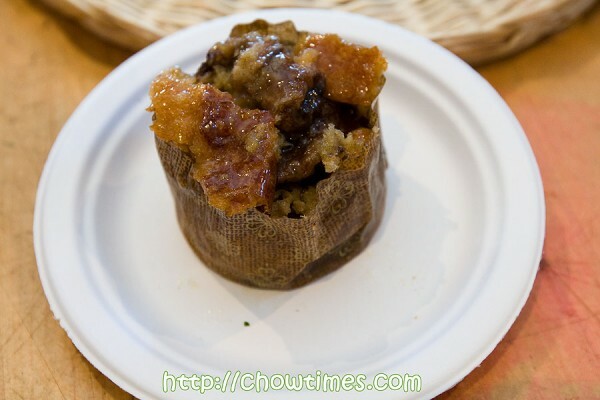 There are a few stalls which specializes on little known regional Chinese cuisine. There is a stall just right at the entrance to the car park. For some reason, this strategic spot had always been a Malaysian stall. This place must have changed hands at least once in the past 10 years. I am not surprised if it had changed owners several times already. In Malaysia, this is called the ABC. ABC is short for Air Batu Kacang, literally translated as Red Beans in Ice. 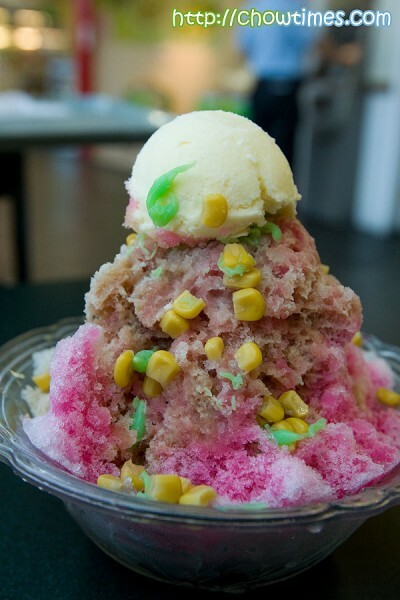 It is also known as Ais Kacang. This is an excellent choice of dessert for summer. A friend at work sent me this a couple of weeks ago. It is so funny (and related to chow!) that I thought you all would also enjoy this as much as I did. The last time we attended a EAT! Vancouver event was in 2006. Back then we went away quite disappointed with the exhibits, shows or even the food that was sold there. 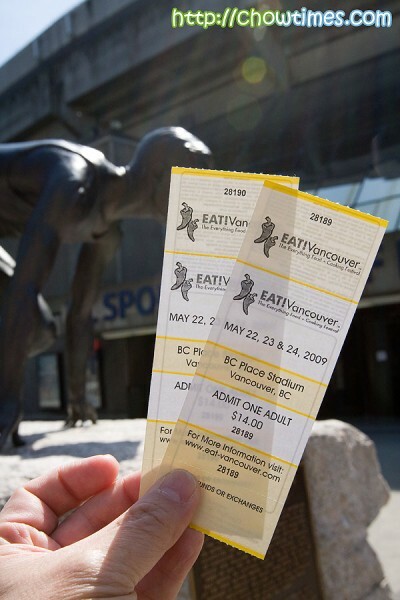 We had free entrance tickets provided by the EAT! Vancouver organizer. We made arrangements with Angie of Sea Salt with Food to check this year’s event. While waiting, we were surprised to see Anita coming up and say hi to us at the entrance. We met Anita at Pearl Drops a few months back. One tip for attending the EAT! Vancouver event. You want to go there just as they open. This is because by mid-day, it will be impossibly crowded. There are long lines on some of the more popular stalls. 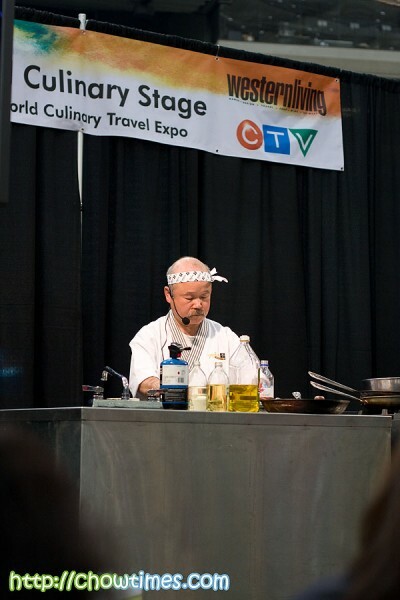 Our primary target is to check out the Bite of Vancouver. This is where Vancouver restaurants offers appy-size servings of their regular menu selections. We thought that this years event is dominated by curries. LOL! Somehow we seem to see curries being represented quite disproportionately to the cuisines you normally see in Vancouver. Notably, there was an absence of Chinese food. Frankly, we did not find the Bite of Vancouver too exciting. Maybe except for Ashiana who had the chef making fresh roti. It was about the only action cooking here. 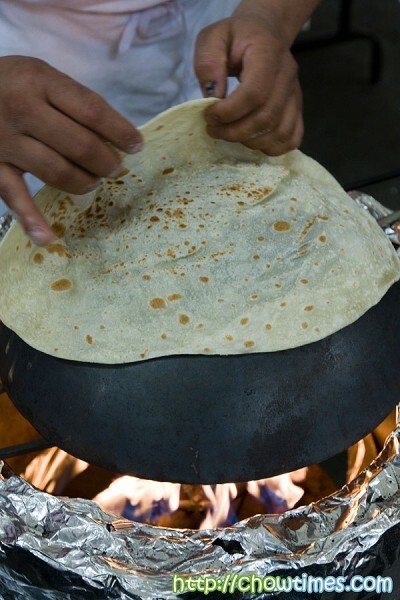 They can only make one roti at a time and so the wait for a piece of this does take a while. Ashiana seems like the most popular stall judging by the long lines. ll and the BC Roll. So I guess that settles it for me then … that this man was indeed the person behind the two most popular rolls in this region. He he he … I must say that he is not a particularly an interesting speaker. It was hard to follow what is going on. The stage is raised high. They have TVs installed above the stage but it was quite useless. Well, firstly the picture quality is quite bad but then what they could have done is to get a cameraman to go on stage and shoot the action on the counter. Updated: 11th Oct 2010: this restaurant is closed according to Urbanspoon. This is a complementary meal from Circa Restaurant and Lounge. You have no idea how rough a week it had been for me. There is simply too much work but yet so little time. Thank goodness that there are some wins along the way … and thank goodness there are Fridays! Suanne and I were back at Circa Restaurant and Lounge yesterday. We were actually in Circa’s a couple of weeks ago for their official launch (we blogged about that event here). The event was not exactly conducive for a tasting. 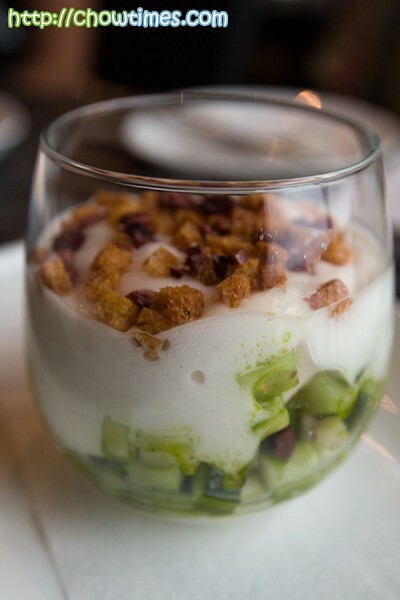 So, we made a return visit to Circa just for that — to really savour their food. Ever since we blogged about Circa, we were rather surprised by the number of hits from Google searches. It seems that quite a lot of people were aware of this newest restaurant and lounge already. 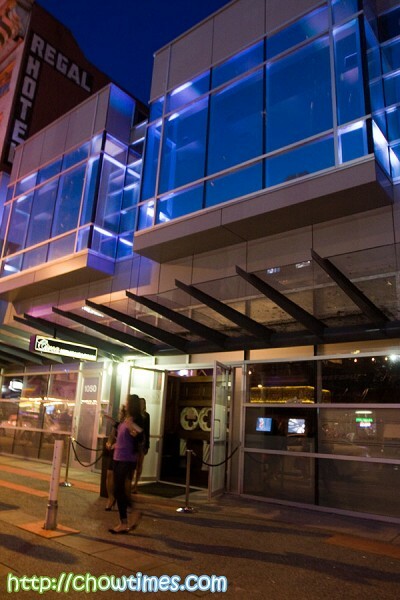 With Circa located right smack in the middle of the Granville Entertainment District in Downtown Vancouver, Circa could very well be a major congregation point on this area. Who knows with the revitalization of Granville to its former glory, this street could be as big as Robson today. 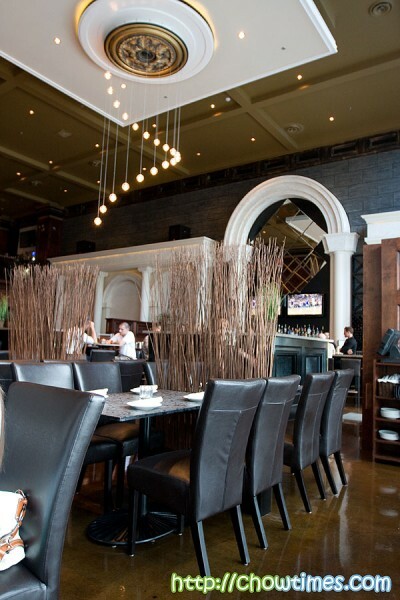 After all, with almost 200-seat dining room, Circa is the largest restaurant on Granville. 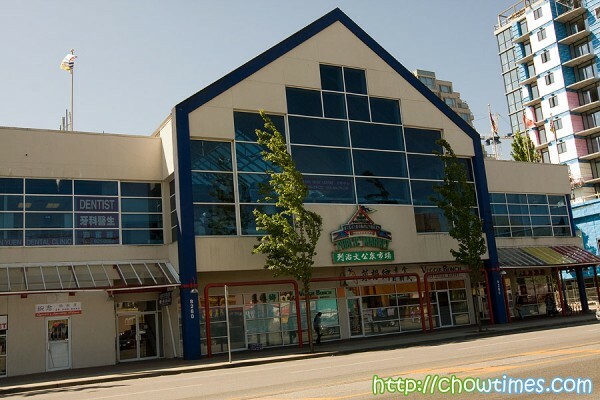 It is perhaps even the largest restaurant of its style in Vancouver. The restaurant is build from the ground up. One would have thought that Circa is built on an existing building but no, it was built out from an old parking lot. This allows the restaurant to have an unrestricted free hand in the design of a restaurant that allows them to redefine the dining experience. Spread over the main and mezzanine floors, there are seven distinctly different sections and able to accommodate comfortably after work socials, intimate dining and large group functions. We were drawn to the high ceiling, and walls dominated by white columns, gold leaf edges and elaborate woodwork. In short it was a perfect place to wind down a tough week at work in an intimate environment. Service was excellent and timing was perfect. We like it when the wait staff came by at the right moment when we are ready. You know sometimes how awkward it is when you need more time to peruse the menu and they came by again and again asking if we are ready. LOL! Their 2 oz premium cocktails ranges from $8 to $14 (including taxes!). Circa’s cocktails seems to be dominated by fruit juice and puree which were prepared daily. 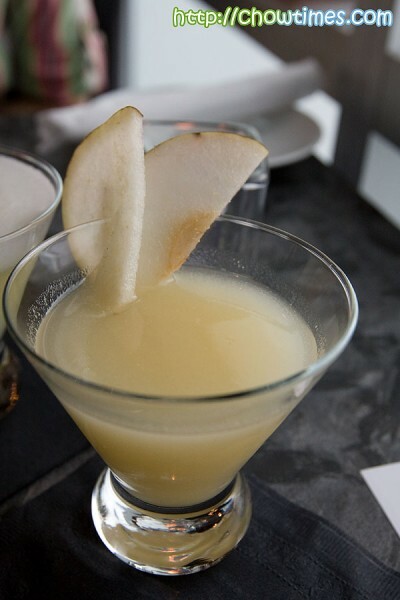 I ordered the Life and Lavender which has Grey Goose La Poire, Giffard Pear, Lavender Honey, Pear Puree and Lemon Juice. Knowing that I light up bright red on strong alcohol, I asked that they half the shots. Suanne surprised me. She went for a cocktail too (not virgin mind you!). LOL! Her choice was the very lemony juice cocktail called the Lemon Tree. 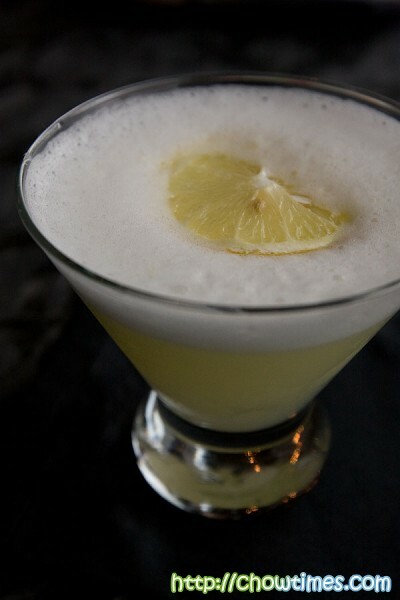 This is Grey Goose, Cointreau and Lemon Juice. She likes it. Circa’s cocktail are based on classic drinks but made with an unique twist. We started off with the Pulled Qualicum Pork Poutine ($7). This is the most unique poutine we ever had. 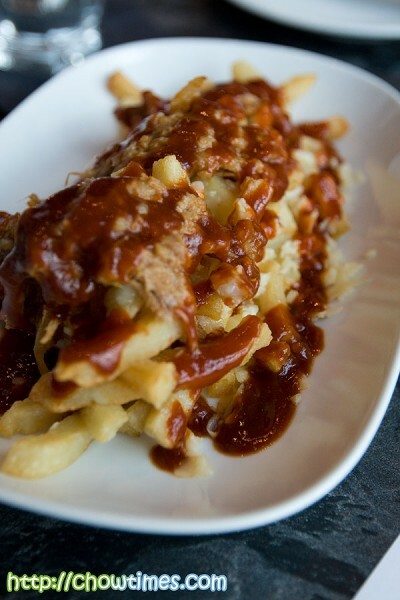 Instead of cheese curd and brown gravy, ours had slow cooked shoulder and aged cheddar over hand-cut fries. It was really good and was certainly a fries with a twist. They managed to redefine a very simple Canadian comfort food to something that every could equally love. What we enjoyed most was this Greek Salad. Simple name but redefined into something more interesting and unique. Carol and Charlene worked on the Corn and Shrimp Tortilla Soup at the South Arm Cooking Club for Seniors. Looks like we had fewer participants for this cooking meet as Charlene and Stella have to pitch in to help out the teams. This recipe is adapted from Cooking Light and it serves 8. This Corn and Shrimp Tortilla Soup has the sweetness from the corn, the springy texture from the shrimp and the crunchy texture from the tortilla and a little kick from the jalapeno. 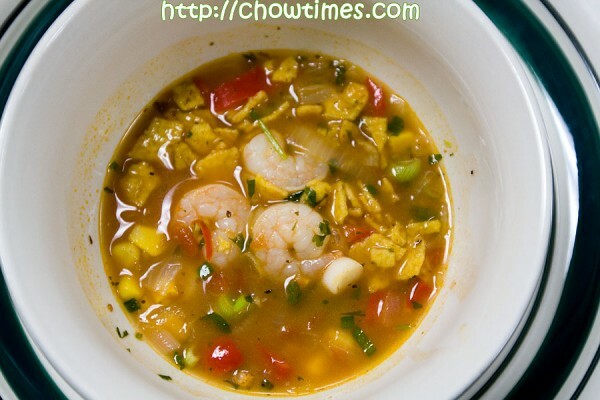 This is a very refreshing soup with the hint of sourness from the lime juice and fresh cilantro. 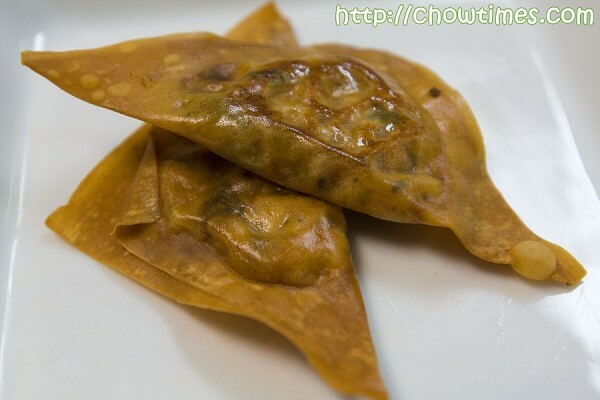 Christina and Stella were assigned to this recipe, Mini Empanadas. However, everyone lends their helping hands when it comes to forming the Mini Empanadas. This recipe is adapted from Southern Living. It yields 36 tiny empanadas. These little Latin-inspired Mini Empanadas are irresistible right out of the oven. They’re are incredibly low in fat because they’re baked, not deep fried and yet they are crispy. The raisins add a touch of sweetness to these empanadas. Mary and June teamed up to make this side dish in the South Arm Cooking Club for Seniors. The Chard with Chickpeas and Olives tastes wonderful stuffed into a pita, or served on top of brown rice for a quick vegetarian lunch. 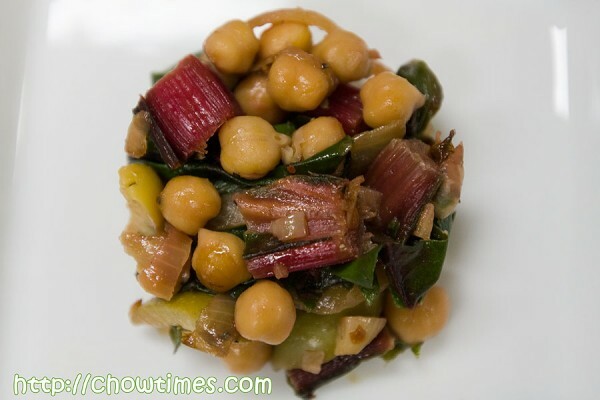 This versatile Chard with Chickpeas and Olives side dish tastes best served hot or at room temperature. The chickpeas lend sweetness and textures to this dish. Chard has shiny green ribbed leaves, with red stems. It has a slightly bitter taste. 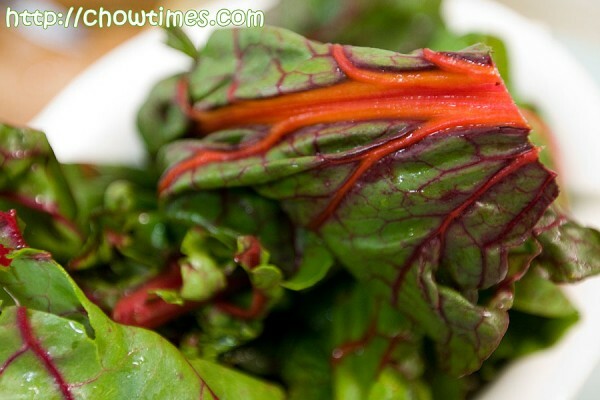 Fresh young chard can be used raw in salad. Mature chard leaves and stalks are typically used in soup like this Italian Wedding Soup or sauteed which reduces the bitter taste. The South Arm Cooking Club for Seniors meets again for their forthrightly cooking fun. I envied these group of seniors who are filled with enthusiasm and making full use of their retirement. They enjoy cooking, gardening and each others company. 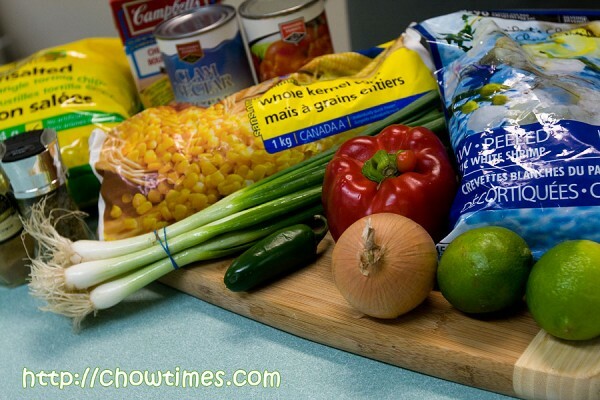 For this week’s cooking session, Charlene picked four recipes from Cooking Light. The seniors are very careful with their food intake and they practice healthy eating. 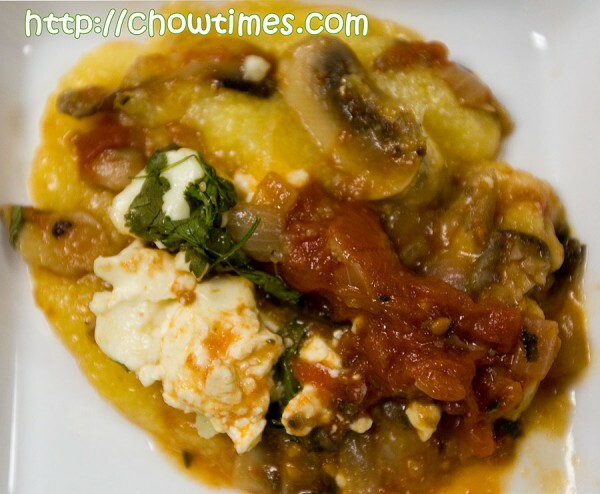 The first recipe is Polenta with Smoky Mushroom Ragout. To our surprise, this dish turns out to resembles lasagne. The polenta in this recipe is baked in the oven, as opposed to using the traditional method of stovetop cooking. This method frees you from constantly stirring the polenta and you can prepare the mushroom topping while the polenta is in the oven. Polenta, at its most basic, is boiled cornmeal mush, a cousin of grits. Popular in northern Italy, it can be served as a starch to be topped with sauces, or as an accompaniment to meats. Once chilled, it becomes firm and can be sliced and grilled, fried, or layered in casseroles and baked dishes. 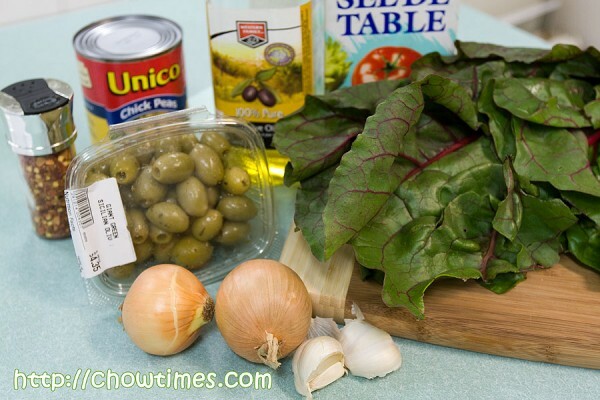 Composed primarily of carbohydrates, it is low in fat and a good option for a gluten-free side dish. Many polenta recipes call for copious amounts of butter and cheese, as polenta by itself is very bland, so exercise good judgement while cooking. 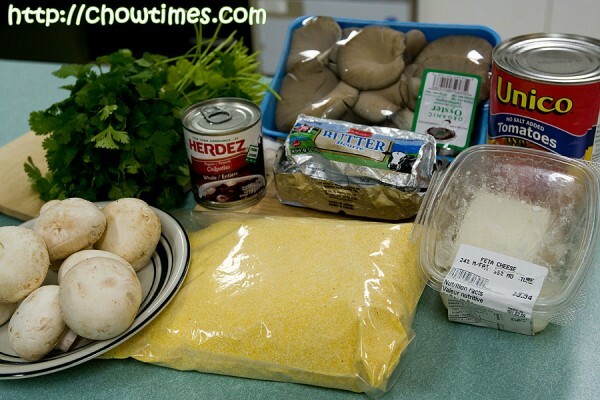 Here in Canada, you can use cornmeal to make polenta. The smaller the grind, the quicker it cooks. Traditional Italian polenta is quite coarse, and can take between 20 to 40 minutes of stirring on the stovetop. Cooking for less time results in grains that are more distinct; the longer cooking time results in a creamier consistency. You can also make polenta using a microwave which I had blogged before here. After the cake meet at Meinhardt Fine Foods, Polly and I went to do some groceries shopping at the Real Canadian Superstore in Richmond. It was a nice warm spring day and we felt like having a cold drink. Hence, Polly brought me to her favourite smoothies place in Lansdowne Mall. 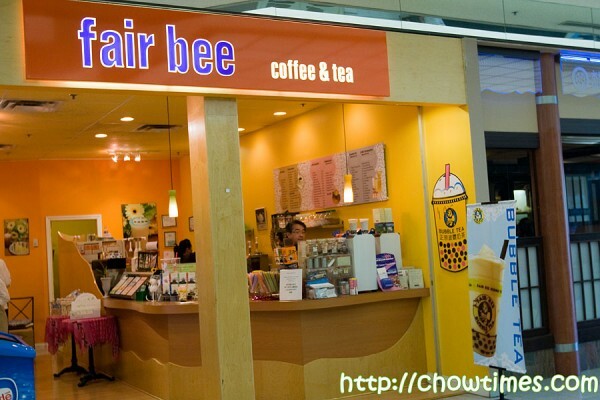 It’s Fair Bee Coffee & Tea. Strangely, their specialties are bubble tea and not coffee & tea. Polly had the special of the day which was Papaya Milk Tea. It’s $4.50 with pearl. I had the a Berry Smoothies which has blueberries and raspberries. 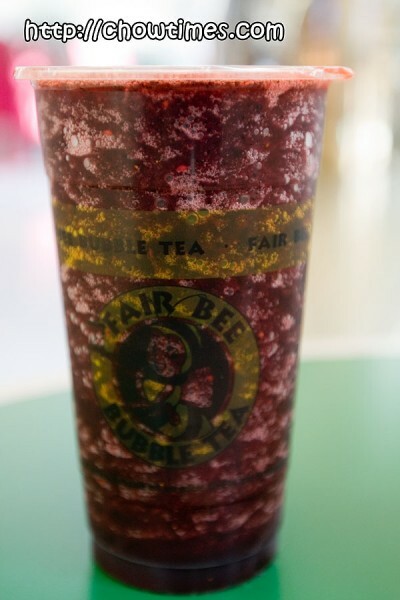 It was icy cold and naturally sweetened by the berries. Mine is $4.00 only as I did not add any pearls. 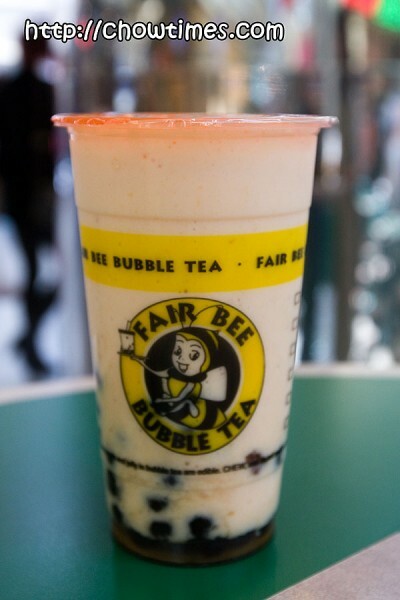 With summer approaching fast, bubble tea will be a popular drink. Updated: 27th June 2012; This restaurant has closed according to Urbanspoon.com. 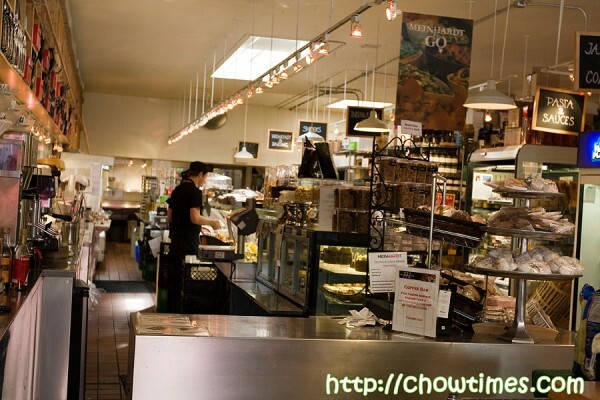 When I blogged about Max’s Bakery & Delicatessen, LotusRapper recommended us to Meinhardt Fine Food. I figure we wont go wrong with his recommendation as he is a real foodie and so Polly and I had our cake meet there one Friday morning. 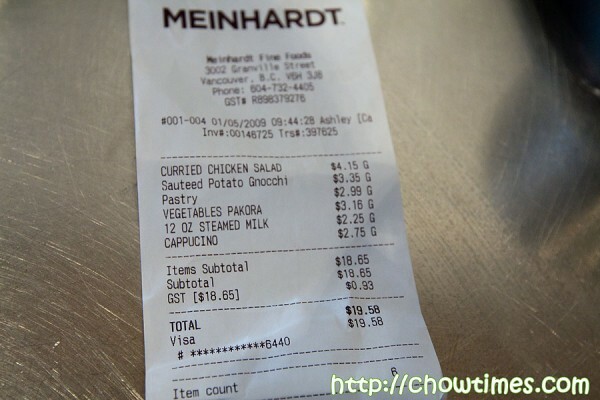 Meinhardt Fine Foods is located at 3002 Granville Street. Since we came from Richmond, we entered the store from the south entrance. I went to check out the place while Polly waited at a street parking behind the store. We want to make sure we can dine in before we feed the parking meter. I only saw two rows of counter sitting in the store and went back to the car to check with Polly if she’ s ok with the counter sitting as she was wearing skirt that day. Polly did not mind. 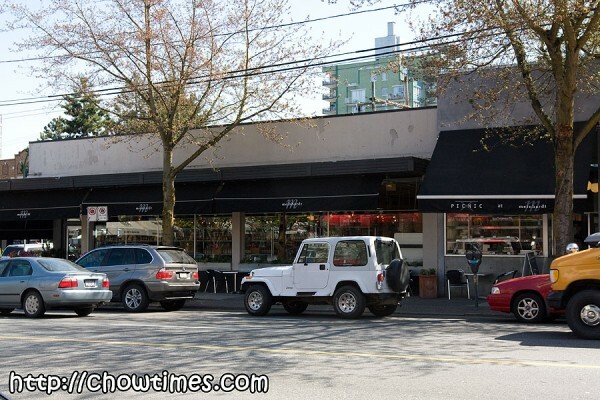 We only found out that there is a dine in place adjacent to the store (with the word PICNIC on the awning in the above photo) after we had finished our meal and decided to take a walk north Granville Street. The Meinhardt Fine Foods has lots of ready made food, include Indian food, salad, sandwiches, cakes, pastries and cookies. They are well staff too. 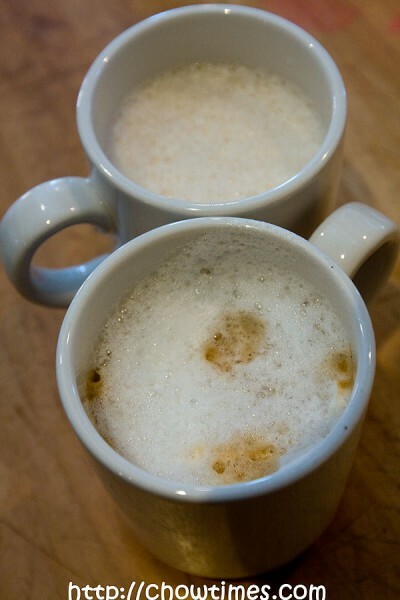 Polly and I ordered Chai Latte and Cappuccino for our drink. However, when Polly sipped into her drink, she realized that she was given steamed milk which she did not mind. 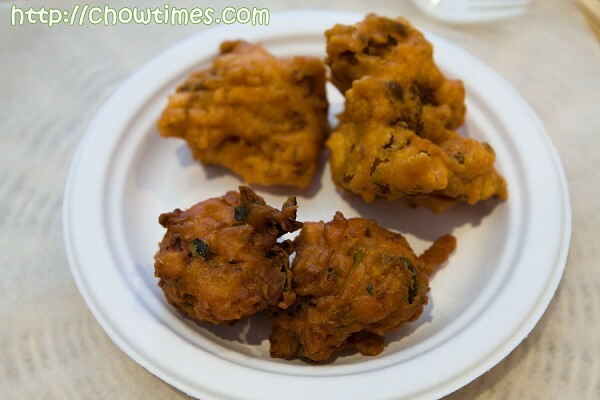 From the Indian section, we ordered the Vegetables Pakora to try. We had the regular Vegetables Pakaro and Cauliflower Pakaro. The regular Vegetables Pakora seemed to have more flavour than the Cauliflower Pakaro. Both are flavourful of Indian spices. From the pasta section, we had Sauteed Potato Gnocchi. It is served cold. 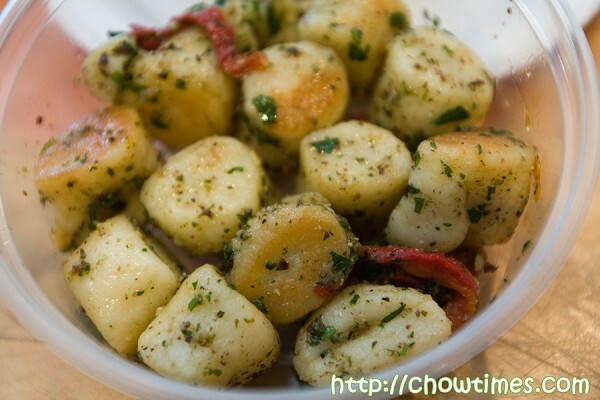 They are very tasty and I like the chewiness of the gnocchi. 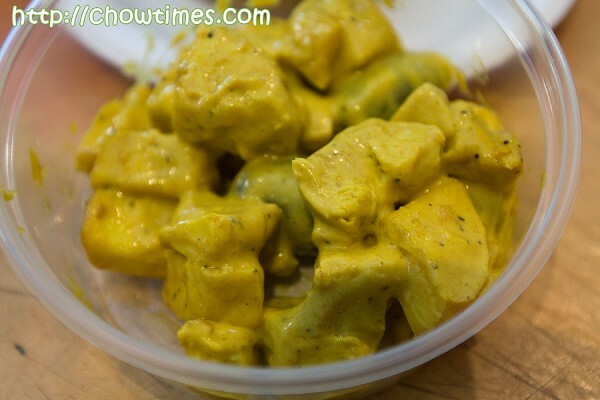 From the salad section, we ordered the Curried Chicken Salad which is also served cold. The salad is slightly sweet and has very mild curry flavour. 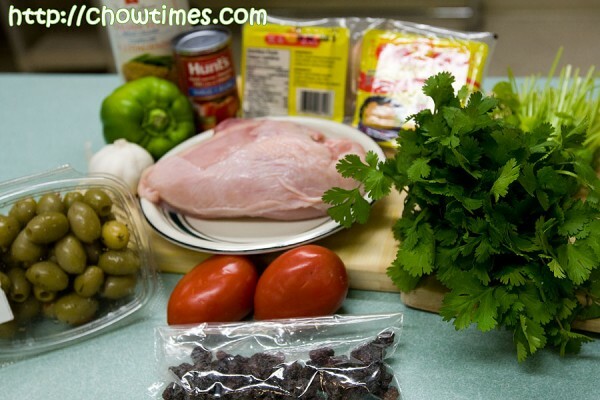 There are potatoes, apples and grapes in the salad, besides the chicken. For dessert, we had the Bread Pudding. It has banana and big chunks of chocoalte in it. Simply love this. The total bill came close to $20. Most of the items there are sold by weight. 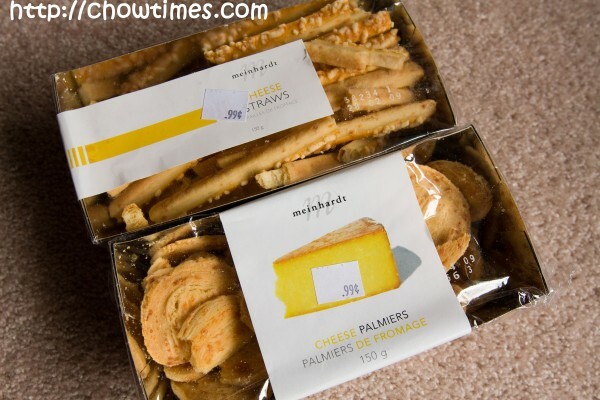 On the way out, we also bought these Cheese Straws and Palmiers which only cost 99cents each. They are good for snacking. LotusRapper, thank you for a good recommendation.